Halloween was just last week, but that only means that millions of people are currently struggling with an inability to resist eating the hoards of candy leftover from the holiday. However, after an entire week of candy, chocolate, and other goodies, the sweetness is no longer enjoyable. But when there’s a piece of it looking you in the eyes, there’s no way that you’re going to resist it, even if it does make you sick at this point. FireBrew Bar & Grill knows this issue way too well. So well, in fact, that we’ve found a fairly effective solution. 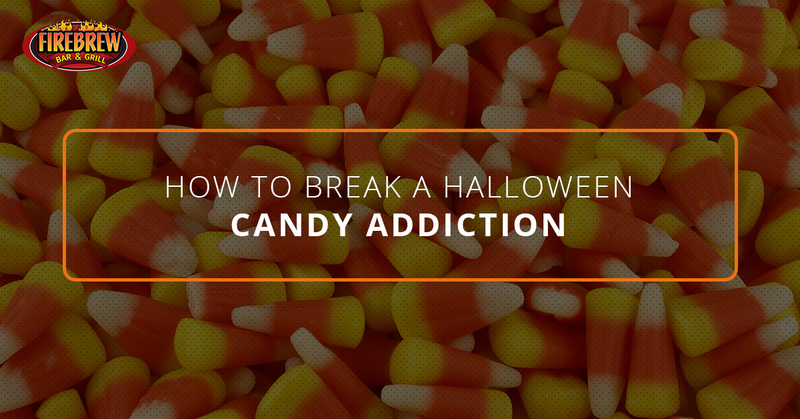 If you’re suffering from a Halloween candy addiction, stop into our restaurant in Virginia Beach for the solution. Vegetables don’t sound very good when you’re comparing them to a chocolate bar stuffed with peanut butter, crunchy things, or caramel. However, if you’re unable to stop yourself from chowing down on chocolate treats, then you need to act fast. Our restaurant, luckily, has a ton of tasty vegetable options. Candy, you see, is primarily sugar, which isn’t good for people who want to, well, live. Stay alive and come in for some veggies that are seasoned and cooked to perfection! We also have a huge list of salads which are also built with the freshest ingredients that we could find. Mama always says that a warm cup of soup could cure any cold, but what about a bad candy habit? Sure could! FireBrew serves up a bunch of hearty soups that are both great for the chillier post-Halloween weather and that feeling that comes over you whenever you pass the candy basket in your home. Our special soup isn’t made of chicken, but rather crab, which is actually better! Shellfish is an excellent source of healthy fats, vitamins, and protein. Bye bye to chocolate for every meal! To break a bad habit, you need to have a healthy mind. And to have a healthy mind, you need to eat healthy foods. Luckily, we serve up some brain and heart-healthy foods at our restaurant. Salmon and tuna are high in Omega-3 fatty acids which are essential for proper brain functioning. Oh, and they’re delicious! Strengthen your mind by coming into FireBrew for something that’s good on the mind and tastebuds! You’re probably used to sugar covered in more sugar. Most candy bars offer several layers of candy, and when that becomes the expectation for foods, things get complicated. Eating something like a carrot is hard because when you bite in, you’re only met with more carrot! Dips offer an easy transition. Dips show the separation between the gooey and the crisp, reminding you that most foods aren’t naturally layered. It sure is a rude awakening, but a delicious one at that. When breaking a bad habit, going cold turkey often results in feelings of withdrawal. You’ve been consuming sweet foods for so long, cutting yourself off might make you sick. Move back into the realm of normalcy with a BBQ Steak Flatbread at our restaurant. Here, you have protein, hearty carbs, and a tiny bit of sweetness to help you make the transition from a candy-based diet to, well, a more normal one. We hope you had a great Halloween! If you’re hungry for something that isn’t candy, then we invite you to our Virginia Beach restaurant. Here, we have a huge menu filled with seafood, pizza, burgers, and more! Check it out soon and stop into FireBrew Bar & Grill today for some tasty food!